A 30 year old female weightlifter had bilateral hip joint pain. It was present for 8 months and she’d previously experienced 24 visits of Graston technique on her groin muscles with minimal improvement. 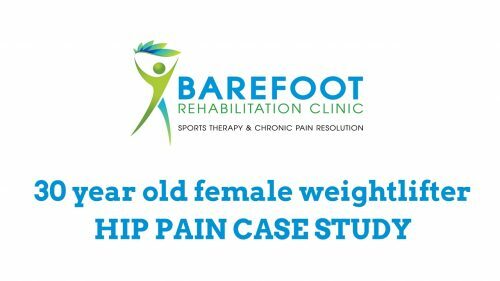 After 3 visits at Barefoot Rehab, she was 80% improved. Thigh to Chest Test – takes 2 minutes to test yourself. You’ll need a partner and somewhere to lie down. Update 6/9/16: Since the video above was recorded, Sari has improved further. When she decreased her high intensity weightlifting load 5-6 days per week to 3 days per week and added CrossFit, her symptoms improved from 80% to 95%. What have you tried for your hip joint pain? If you’re not sure if you have hip flexor pain or an impingement, you should figure this out yourself. Please share and we can begin to have a conversation about what can be done. If you know of a friend or family member with hip joint pain, please forward this information to them so they can get the help they need. Fixing your adhesion matters because it improves flexibility (and allows you to pass this test), improves function, reduces pain, and restores normal movement to the body so you can enjoy the things you love. Call us at 862.205.4847.